Code Generation : "Multi-threaded Debug DLL (/MDd)"
Here is my App.exe.manifest.v "sigcheck.exe - m QrCodeTest.exe"
'QrCodeTest.exe': Loaded 'D:\Project\QrCodeTest\Debug\QrCodeTest.exe', Symbols loaded. 'QrCodeTest.exe': Loaded 'D:\Project\QrCodeTest\Debug\botan.dll', Binary was not built with debug information. 'QrCodeTest.exe': Loaded 'C:\Windows\winsxs\x86_microsoft.vc90.debugmfc_1fc8b3b9a1e18e3b_9.0.30729.1_none_bfff6c932d60651e\mfc90ud.dll', Symbols loaded. 'QrCodeTest.exe': Loaded 'C:\Windows\winsxs\x86_microsoft.vc90.debugcrt_1fc8b3b9a1e18e3b_9.0.30729.1_none_bb1f6aa1308c35eb\msvcr90d.dll', Symbols loaded. 'QrCodeTest.exe': Loaded 'C:\Windows\winsxs\x86_microsoft.vc90.debugcrt_1fc8b3b9a1e18e3b_9.0.30729.1_none_bb1f6aa1308c35eb\msvcp90d.dll', Symbols loaded. The program ' QrCodeTest.exe: Native' has exited with code -1073741502 (0xc0000142). 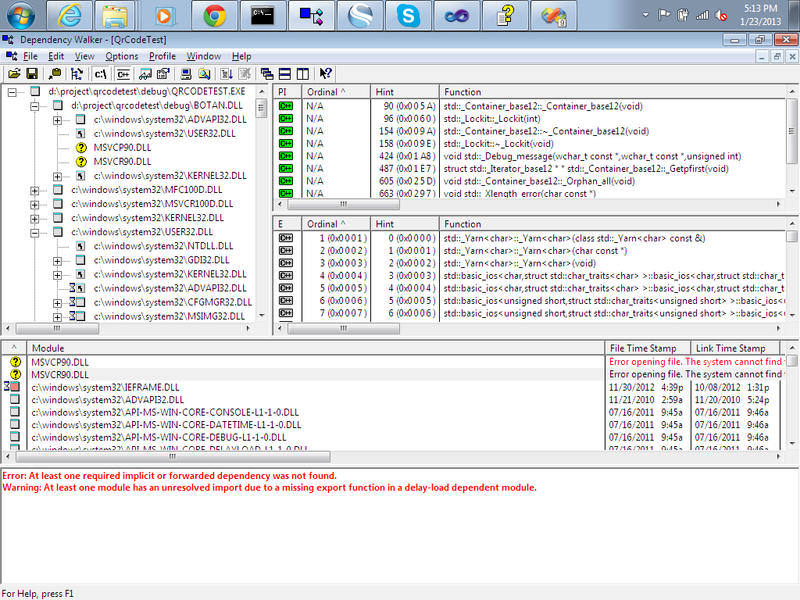 Dependency I ran Debug exe against dependency,here botan should load MSVCP90.dll and MSVCR90.dll instead of MSVCP90D.dll and MSVCR90D.dll.Is this the reason foe the mess.If it is how to rectifiey it. This must be a problem induced by the way Botan.dll was built. Clearly you've got the release build of this DLL since it has a dependency on the release version of the CRT. In general pretty unhealthy mixing that with your debug build that uses the debug version of the CRT, it can cause hard to diagnose runtime errors or memory leaks. A DLL should have a manifest of its own that states its dependencies. Embedded as an RT_MANIFEST with resource ID 2. You can check if Botan.dll has one in Visual Studio. Use File + Open + File, select Botan.dll and you'll see the resources. Locate the RT_MANIFEST node and open it. Verify that resource 2 exists and that it states that it requires "Microsoft.VC90.CRT"
With the expectation that you don't see it, triggering the error. Getting it built with a correct manifest and in general trying to obtain the debug build of this DLL is important to get ahead. ftp://ftp.qt-project.org/qtcreator/qt-creator-2.1.0-src and compiled it in Qt Creator. It will give you botand.dll and botand.lib which is debug version of botan lib.If you download the Windows binary from http://botan.randombit.net/download.html,it won't contain debug version binary which obvious.It might run well for some but will also cause problem for others.So one generate debug binary in this way. Not the answer you're looking for? Browse other questions tagged visual-studio-2008 dll unmanaged side-by-side winsxs or ask your own question. why i don't have Microsoft.VC80.MFC-file? What do I need to do to build a debug version of a VS2008 project and run it on a different computer?